Those of you wise enough to have purchased the rather excellent Kirby: Triple Deluxe will be aware that the mini-games included with the title — Kirby Fighters and DeDeDe's Drum Dash — are jolly good fun, and stand-out releases in their own right. It would appear that Nintendo agrees, because the two games are getting stand-alone launches in Japan later this month. 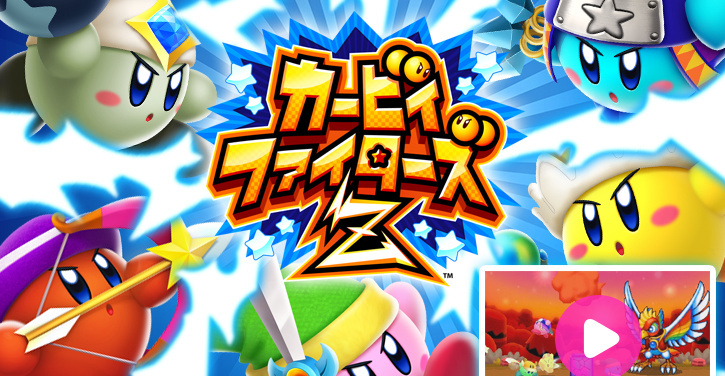 Kirby Fighters Z hits the Japanese 3DS eShop on July 23rd, and appears to add new stages and power-ups. DeDeDe's Drum Dash Z arrives on the same day and boasts new levels and masks for DeDeDe to wear. The price is 750 Yen per game. There's no word on whether these two mini-releases will make the leap to the west — would you be willing to snap them up if they did? Or are you happy with the versions included in Kirby: Triple Deluxe? Check out the trailers below and then let us know your opinion by posting a comment. Sold. all that needs to be said. Nice. I hope this means that the eShop version of Kirby Triple Deluxe will be made available at a discounted price for those who have purchased these standalone games. I picked up Kirby 3D dispite NL's imo inaccurate review. the base versions of these games are actually fleshed out quite well and are awesome fun. If these DLs come to the west I'll certainly be picking up Kirby Fighters Z.
I'd greatly appreciate if Kirby Fighters had online of some sort. It'd be the closest thing to Smash Bros. until October 3rd, but if the price is good; I'll probably go for both anyway. I will be probably picking Dedede's minigame. I loved the Triple Deluxe version (got all four platinum badges! ), but it was too short. The price seems to be very fair. I wonder if the additional content will come to Kirby Triple Deluxe in the form of a free patch or DLC. No word on online play...I like the look of the new additions but that's really disappointing. I wonder if we'll eventually see a Wii U version with all of the bells and whistles? First time I hear the Japanese pronunciation of "Dedede". Somehow, I suspected it was pronounced that way all along. I swear that the Japanese title has too many de's. Drum Dash looks fun, though. Looking for an excuse to get myself a ton of eShop credit again. Might get Kirby fighters, if its cheap, or I might just get the full game when gets cheaper just for the heck of it. I love Triple Deluxe. Here's hoping Kirby Fighters Z connects with the original version. That looks super sick. I'd be beyond disappointed if it's exclusive to Japan. @Tigus The download play in Kirby Fighters was lackluster. The downloaders can only choose from Sword and Cutter. Fun otherwise. Please... bring over these! Especially Dedede. If only these could also be DLC for those of us that already bought the full game? I just feel like these could have been this expansive in Triple Deluxe. Hopefully this get's a western release. Lack of online play is questionable, though I have a feeling their excuse is that it would hurt sales for Smash. I already have Triple Deluxe, but I would stil buy Kirby Fighters Z. So much more content that just looks AMAZING and 2 more addition powers! Also, can't forget that "helmet upgrade" after beating single player mode, so cool! Hopefully a western release very soon! Kirby Fighters Z looks like it has enough new content to warrant a purchase. I do hope you can perhaps buy it as a DLC add-on if you already have Triple Deluxe, though. Would seem like a shame to own the game twice. Kirby Fighters I can see getting it's own eshop title, but the drum one didn't seem to have enough meat to me. But what do I know? Or did they mean full cartridge games? i'm in two minds about this. on the one hand it feels like the people who own triple deluxe should get this as DLC for free, but on the other hand it feels like those two modes in triple deluxe were just demos for these games, devaluing triple deluxe as a whole. will have to know more about it to decide how i actually feel. I would absolutely buy a more full version of Drum Dash. I love that game. Kirby Fighters, I would only buy a fuller version of if it included online mode, the biggest omission in Triple Deluxe. The only game I'm getting from this is Kirby Fighters Z. I'm never fond of rhythm games, which is probably why I managed to finish Dedede's Drum Dash with luck. 750 yen? What do you think that'll translate to over here? $7.99? If they review well (as most Kirby games do), I'll probably get them when they hit US shops. Not sure if I'll ever get Triple Deluxe (not a HUGE Kirby fan, but I like him in small doses), so this might be better for me. I already bought Kirby Triple Deluxe, but this would be good for me and my brothers who don't have any sort of income. Does the fighter game come with online multiplayer at least this time? If not don't waste my time, Nintendo. I'm only buying if it gets released in the West before Super Smash Bros for 3ds gets released. The Eshop Train is starting to really Roll. Hmm, I liked the look of fighters. Have to think about this. I think despite Kirby Fighters being more better/approachable to Dedede's Drum Dash in triple deluxe, i think i have to give the edge to Drum Dash Z, just because of the potential of much more stages and whatever..assuming there's more than 4 stages, it could work out as a rhythm game to an extent. But Kirby Fighters Z seems a little generic compared to its Vanilla version, stick online on it, maybe have something of a Helper to Hero-esque way of sticking to a single ability in an "adventure mode" of sorts on local wireless, with quirky things like new items or altered bosses to facilitate the differences in TD's adventure mode and Z. Might be neat if they added backwards compatibility for people with Triple Deluxe for Fighters, makes the game more accessible to an extent outside of Japan, if the other person doesn't have TD on them. I kinda wish they'd given Dyna Blade a new model instead of using her sprite, but at least the game has Fountain of Dreams and Butter Building as stages. @StephenYap3 I love rhythm games, but DDDDD was really hard for me to get used to; I can't beat the final level with a platinum medal. I'll buy Kirby Fighters if it comes West. Given I own the full game, I can't help but feel a bit betrayed given Kirby Fighters played a huge role when I considered purchasing it. Nevermind this is adding salt to the wound that is waiting for the portable Smash, the fact we're getting a more complete version of Kirby Fighters before we'll even get a downloadable demo (if there's one at all!) version of SSB43DS seems like a bit of a back stab. It'd be nice to have a "Kirby Ambassador program" that grants access to either minigame as a freebie, but that'd be swiny flying territory. Oh well! On the bright side, we have a cheaper, downloadable Kirby-only SSB to ease the excruciating wait for the pocket Smash Bros. we've always been waiting for. I would legit download Kirby Fighters Z. That's the only part of Triple Deluxe I want to begin with. If Kirby Fighters Z has online then count me in. Well, since a lot of people already have Kirby Fighters for 3ds via triple deluxe I'd much rather get the extra levels in a dlc package instead of buying an entire seperate game.